Get a sneak peek before the Early Access launch. 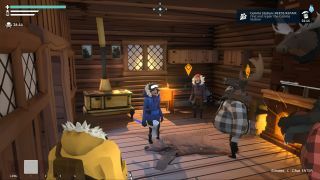 Stuck in a chilly wilderness, eight players will need to work together to fend off bears, gather supplies, make repairs and, if they’re lucky, escape with their limbs and lives in tact. Unfortunately, not everyone is in it together. Lurking among the survival buddies are two traitors with a single goal: stop the others from escaping. Check out the gameplay trailer released a couple of weeks ago. This sounds very much like my kind of thing. Communication is key, says developer Other Ocean Interactive, so players will be able to use proximity chat, emotes and walkie-talkies to stay in contact even when they’re out chopping down trees alone. Expect arguments, accusations and murder. You can sign up for the open beta here, and Project Winter will hit Steam Early Access on February 7. The plan is for it to run for three to six months, adding polish, additional map layouts, new items and more.